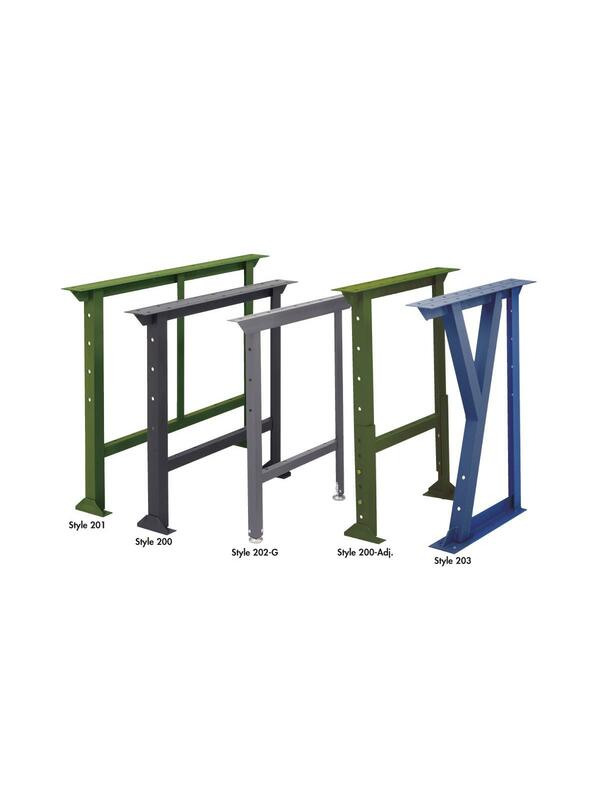 Stationary Work Bench Legs | Carolina Packaging & Supply, Inc.
MATERIAL - All bench legs, stationary and adjustable except Style 202, are made of heavy duty Arc-welded 2 x 2 x 1/8" angle iron. 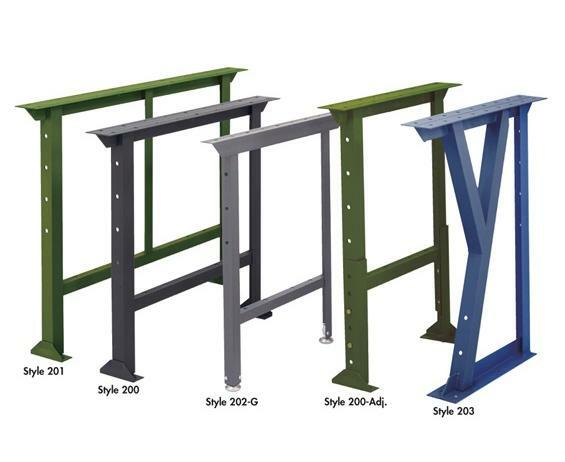 Style 202 Bench legs are made of heavy duty Arc-welded 1-1/2 x 1-1/2 x 1/8" angle iron. Available in Gray or Green (specify color in comments section when ordering). 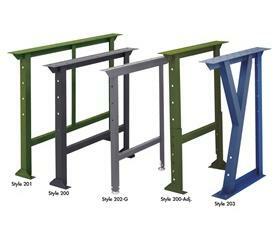 Style 200 - This benchmark bench leg has been the industry standard for decades. 5" foot pads are pierced for optional bolting to the floor. 4" bench leg top allows for the use of a common leg between 2 workbench tops. Multiple holes on the front and back of the uprights mean flexible stringer and tool mounting options. Style 201 - Bench leg is a larger version of Style 200 with the addition of a center upright, also pierced multiple times, for even more flexibility with stringer and tool mounting options and providing an unencumbered flow below the work surface from both side of the workbench. Style 203 - "K" leg has a 4" bench leg base pierced for optional mounting and stability and has the front upright set in and up at a 45 degree angle providing additional range of motion below the workbench, and is pierced for the addition of a durable formed steel foot rest. Style 202-G - Medium Duty bench legs are versatile, exceptionally strong, and come with adjustable height non-marring leveling glides making them perfect in any setting: factory, office, garage or basement. 5" foot pads and locking swivel casters are also available. Available in Green or Gray. Additional colors available - contact us for details. FOB Shipping Point. H3036/3642 6" Adjustable Leg Heights in 1" increments for all styles, except H203 series. See Related Items tab for Mobile Style Work Bench Legs and Pollard Work Bench Accessories.